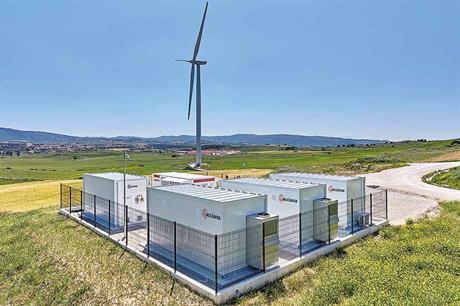 SPAIN: Acciona Energy has added a battery storage facility to one of its wind farms, allowing it to further explore grid integration and the use of wind generation to provide reserve power from its central renewables control room. When Acciona Energy inaugurated its 1.7MW peak-power lithium-ion battery experimental facility in September 2017 at its 15MW Barasoain wind plant in the Navarre region, the Spanish renewables giant joined a global wave of research and development pilots in battery storage for wind power. The firm claims the Barasoain storage project marks Spain's first dedicated battery unit for grid-connected wind power, following Gamesa's use of a lithium battery for storage at an off-grid solar, wind and diesel hybrid in La Muela, in May 2016. The facility underlines Acciona Energy's continued commitment "to staying ahead of the curve in grid-integration technologies for renewables", says CEO Rafael Mateo. The inauguration day was hot and anticyclonic, and hardly a turbine stirred. Not the best circumstances for showing off the Acciona Windpower turbines, installed four years ago, prior to the merger with Germany's Nordex. Yet, with electrical meters showing steady output from the adjacent batteries, conditions were ideal for illustrating the workings of the storage unit, aimed in part at demonstrating power supply capability for the grid precisely at such downtimes. The storage pilot comprises one of the five 3MW Acciona Windpower turbines at Barasoain, connected to two lithium-ion Samsung SDI batteries, each housed in a separate container. One container houses a rapid-response 1MW/0.39MWh power battery, capable of maintaining 1MW of power over a 20-minute period. The other contains a slower-response battery that can supply 0.7MW over a 60-minute period. The system also involves three other containers. One is for inverters and a transformer, installed by Ingeteam, Acciona Energy's partner in the project. Another comprises medium-voltage cells and analysers, while the third holds the control and monitoring equipment. But "the real innovation lies in the software", says Mateo. Called Adosa and developed by Acciona Energy's research and development team, that software won the Spanish Wind Energy Association's 2017 award for innovation. Acciona's expertise in this field has developed since the launch of a similar-sized battery storage unit at a nearby solar PV plant in 2016. 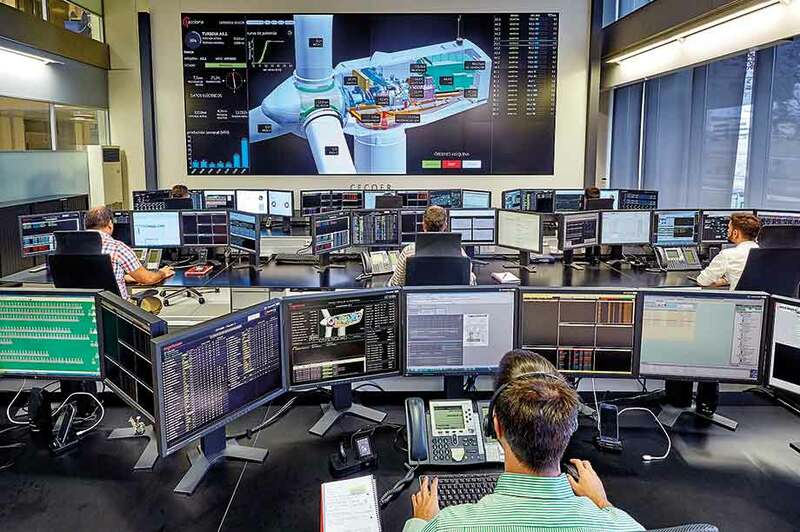 Adosa performs simulations of electricity-market and grid-operating conditions to determine a whole range of scenarios for optimising battery storage and power sales to the grid. One of the main areas under research is the possibility of storing wind production at trough power demand, when the electricity price is low, to sell at peak demand times, when the price is higher. Cost effectiveness must remain the key when it comes to storage, and the wind sector must be careful to avoid being led by the nose by the key beneficiaries of battery storage - battery vendors such as Elon Musk. So says veteran wind-sector observer and former Windpower Monthly editor Lyn Harrison in Electricity Storage Explained, a paper written jointly with the magazine's economics consultant David Millborow for consultancy Foresight Climate & Energy Business. Harrison warns against buying into the myth that wide-scale storage deployment will provide "the missing piece" to renewables deployment. Large amounts of renewables are already handled without requiring storage, she says. This is the case in Spain, where wind has topped 60% of penetration levels, and Denmark, which sources 54% of electricity supply from renewables. "Using stored power will always cost more than using it directly," says Harrison. Therefore, any deployment of storage should ensure "the value of the service is greater than the added cost". Indeed, rather than backing up base-load generation, "the most immediately effective and profitable applications for battery storage for wind power lie in providing grid-operation ancillary services", says Alberto Ceña, CEO of wind consultancy Bepte and veteran technical director of Spanish wind association AEE. Ceña admits storage may have a strong role to play in isolated grid systems, such as on the Canary Islands, where it could provide cheaper power than conventional generation, which depends on expensive diesel imports. But for mainland scenarios, Ceña sees battery storage mainly providing power "in a rapid response, measured in tenths of a second" to balance frequency and voltage modulations across national grids resulting from variations in demand against generation. "Optimum profitability will lie in proper sizing of expensive battery storage," says Ceña. The extra expense may be offset by wind participating on the ancillary services markets for rapid and short-term provision of "emergency" power, paid at premium rates, he explains. With increased amounts of installed renewables capacity, the most-effective rapid-response providers — combined cycle gas (CCG) plants — are being pushed off the grid in many countries. Spain is a typical case, with 23GW of installed wind capacity often pushing most of the 28GW of CCG capacity off the spot electricity market. However, grid operators always keep some gas capacity online, as the rotating inertia of the CCG synchronous generators provide a typical response time of 0.05 seconds to ramp up power output by around 10% of full capacity (if operating below full capacity). Until recently, wind power was unable to provide emergency response power for frequency and voltage control, as it traditionally operates at maximum power with none in reserve. Now, battery storage, although constituting an asynchronous power supply with no moving parts and inertia, is already managing to provide a ramp-up response time of around 0.2 seconds, according to Ceña. New software being developed, such as Acciona's Adosa, can be combined with advanced power electronics to provide so-called digital inertia. This will improve response times, making stored wind energy an increasingly competitive player on the ancillary services markets, Ceña believes. Few are better placed than Acciona Energy to optimise all the benefits of battery storage. The company has 9GW of renewables operating globally, 7.3GW of that from wind, all controlled centrally from the company's renewables control centre in Sarriguren, near the Navarre capital of Pamplona (pictured below). Using a hand-held remote control, Mateo shows an overview of all of Acciona Energy's solar, mini-hydro and wind capacity across the globe on a giant screen that occupies an entire wall. He clicks to a view of the oil temperature in a single turbine gearbox in Mexico, then to the rotor speed of another turbine in Australia, and on to the output of a plant in Canada. In February 2016, this extensive real-time control over its renewables fleet enabled the company to provide reserve power commercially from its wind generators to fill a gap on the grid caused by conventional thermal-power shortfalls — for the first time anywhere in the world, Acciona claims. This was achieved by slightly pitching the blades out of their usual optimal angle with the wind, leaving national grid operator Red Eléctrica de España (REE) a reserve of power to call upon, at a premium, just when it was needed. Competitors Gamesa and Iberdrola had demonstrated the feasibility of the technique with their Syserwind demonstration project completed in 2014. But while the wind sector is increasingly wary of the unnecessary expense of large-scale storage deployment, policy makers have been slower to catch on. Indeed, it is policy pressure in Australia, spurred by large-scale blackouts, that has ushered in demands for battery storage. Mateo cites consultancy Navigant, which expects turnover from utility-scale storage to soar from $220 million in 2014 to $18 billion in 2023. He adds that Latin American countries and South Africa, major Acciona Energia markets, are also considering such measures. "We are currently looking very closely at all power auctions requiring storage for renewables, including those of Australia," he says. The Barasoain project is part of a global trend exploring battery-storage options for wind. Last month, technology tycoon Elon Musk's Tesla officially launched a 100MW/129MWh lithium-ion battery — the world's largest, Musk claims — at the 309MW Hornsdale wind project in South Australia. This trumps Tesla's 20MW/80 MWh California battery-storage facility unveiled January 2017. Hornsdale follows developer WindLab's contract with Tesla for a 2MW/4MWh lithium-ion battery-storage system at its wind-solar PV (60.2MW and 15MW, respectively) hybrid Kennedy Energy Park in Queensland, Australia. In June, Swedish utility Vattenfall and its Dutch subsidiary Nuon connected a 3MW/3.2MWh battery unit made from BMW i3 batteries at the 122MW Dutch Princess Alexia onshore wind farm.